Love, Mrs. Mommy: Year Supply of Sandwich Bros. Products! $312 RV! 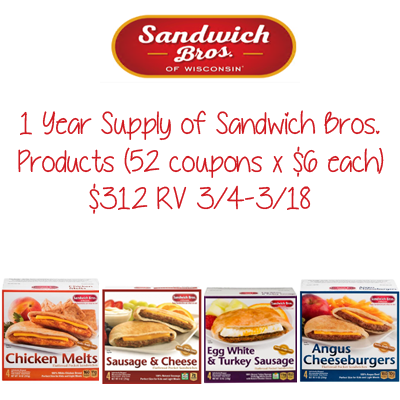 Year Supply of Sandwich Bros. Products! $312 RV! Free food for a whole year?! How awesome is that?!! This is a $312 RV giveaway! Good luck! I haven't to be honest! But they all look fabulous! Yes, I have. I love the chicken melts! I've never tried any of the sandwiches, but I would love to win so I can! I have heard of them but never tried them. I would love the Chicken Melt! I haven't tried or seen Sandwich bros products before but I'll keep a look out for them. I'd go for the Egg White & Turkey Sausage.